This ultimate cold-weather boot brings together Bionica’s signature leather and knit combo in a new tall silhouette! 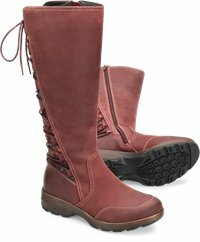 Featuring waterproof leathers and a seam-sealed construction to help keep your feet dry, and adjustable laces on the shaft to give you your perfect cozy fit. Absolutely love. Comfortable fit around my calves even with heavy leggings, plenty of room (with a size larger than a shoe) for an orthotic insert and heavy sock. Wore all day and was so comfortable, loved the look, loved the ease of putting on and off. Nice leather that came well oiled. Just so in love with this one! Love these boots so much! They are waterproof, warm, and stylish. At the loosest, I can easily tuck in skinny jeans or leggings, or they can be tightened a little and worn under looser cut jeans or even with a skirt or dress. I wear an 8- 8 1/2 depending on brand and an 8 1/2 in these boots allows me enough room to wear thicker socks yet isn't too loose with regular socks. Love this bot. It’s well made and durable, however the width in the calf is too small. I hope they give a little or else I might need to return. I needed a wider calf so had to return but extremely comfortable and well made otherwise.